Amaghasa Azalea is in the group of Satsuki Azaleas. These Azaleas originated from Japan, Satsuki meaning 5 month, which is when these flower. These are late flowering varieties and will flower in Late May or Early June. The Satsuki Azaleas are slow growing dwarf varieties usually not getting taller than 2-3 feet tall. These are evergreen and are great to use in the landscape when needing to extend the Azalea flowering season. 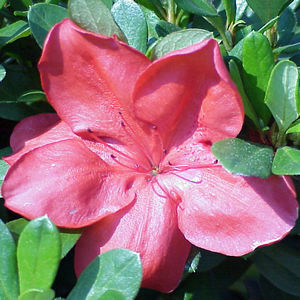 The Amaghasa Azalea has red flowers.